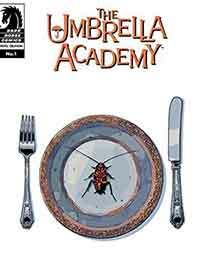 The Umbrella Academy: Hotel Oblivion Average 4.00/5 - out of 2 total votes. Our heroes are scattered after Sir Reginald Hargreeves‚ death. Number Five is a hired gun, Kraken stalks big game, Rumor is dealing with the wreckage of her marriage, a rotund Spaceboy runs around the streets of Tokyo, Vanya continues her physical therapy after being shot in the head‚ and no one wants to even mention Seance until issue #2. Hotel Oblivion #1 comes to you in October, but this special summer preview gives readers their first glimpse into the lives of these strange heroes in nearly ten years, but picks up the story directly from the events of The Umbrella Academy: Dallas.